Hello! and happy valentines weekend to you all! This weeks stitch of the week is the knotted pearl stitch and once again is brought to you by the lovely and talented Mary Corbet. This is a much unused and beautiful stitch. It is a great outline stitch as well. Look at what can be achieved .... This looks like paisley to me and you all know that I adore paisley. I found this picture of the knotted pearl stitch, although it did not say who had stitched it. I think this is lovely with the French knots it makes it quiet beautiful. I am going to give this ago myself. I have done some paisley work with Dorset feather stitch, you may remember last year I showed you the vintage embroidery book that I found dedicated to that stitch. 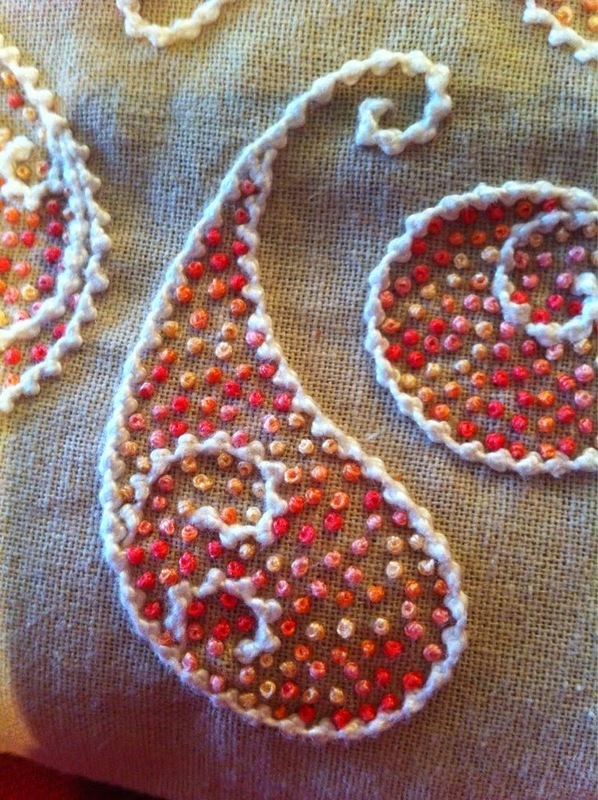 This is another way to get a paisley pattern and I am thrilled to see the knotted pearl stitch made into such a wonderful pattern. I hope you enjoy this weeks tutorial and enjoy your weekend.